Horror young’uns hear the word “saw” and they envision intricate and inane torture traps that get increasingly more ludicrous with every passing sequel. To hardened horror vets however, the word means one thing and one thing only — the granddaddy of them all, The Texas Chain Saw Massacre. Much has been said about the seminal 1974 masterpiece (including by us, listen to our Really Awful Movies Podcast about TCM). Some call it the scariest, most disturbing, most harrowing, most revolting American horror film ever made. Kids today call it a bit of a snooze, but what do they know? Each accolade, each approbation and every bit of esteem for TCM is well earned and well-deserved. The ‘saw truly is king. But what we’re talking about here is a different beast entirely. It’s the film Dennis Hopper named as the worst he’d ever appeared in (this, of course, coming from a man whose resume includes Waterworld and who starred in the big-screen adaptation of Super Mario Brothers, a movie which currently sits at a comfy 16% on Rotten Tomatoes). 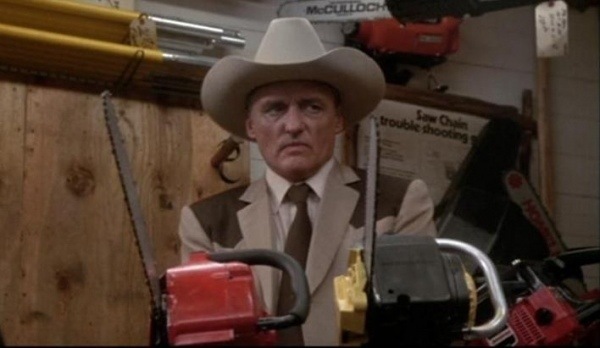 We’re talking about the 1986 sequel, The Texas Chainsaw Massacre 2. Now any sequel made almost 13 years after the original is up against some serious resistance. But if you’re Tobe Hooper, whose career had been floundering since he made the original (his prior film was the lifeless remake of Invaders from Mars) and the Golan/Globus Cannon group offers you truckloads of money to film a sequel to your one true masterpiece, what are you gonna say? Why yes, of course! Tobe got on board, and despite Hopper’s assertion, which was probably filtered through whatever peyote haze he was experiencing at the time, TCM2 is actually sorta good in an awful movie sort of way. While the original had a few moments of (albeit dark) comedy, this one is almost pure-parody. Theater-goers in the 80’s who were expecting the same tone as the original would have been tipped off by TCM2’s poster which depicted the Sawyer clan posed in a cheeky homage to The Breakfast Club. And while blood was used sparingly in the original, this one is an all-out gorefest courtesy of makeup- maestro Tom Savini. The events begin when a couple of joyriding yuppie nimrods call in to a late-night radio request show hosted by Stretch, (Caroline Williams). In the midst of the call they are attacked, and one gets half his head lopped off courtesy of Bubba Sawyer, better known of course as Leatherface. Because this slaughter went out over the air, it attracts the attention of lawman Lefty (Hopper), who has been harboring a decade-plus vendetta against the Sawyers, a result of a tenuous familial connection to some of the victims of the original. Stretch and Lefty propose to team up in order to bring down the nefarious, cannibalistic Sawyer clan once and for all but instead end up forming the least cohesive tag-team since the Killer Bees. Oh, did I forget to mention Chop-Top? The newest addition to the clan is a Sonny Bono wig-wearing, head-scratching, Vietnam-vet with a metal plate who was off serving the country during the events of the first film. He is not the hitch-hiker from the original, despite many viewers assuming that he is. In actuality, the hitch-hiker plainly did not survive his run-in with the semi at the end of TCM, as he’s now the corpse-puppet Nubbins whom Chop-Top lugs around and occasionally speaks through. 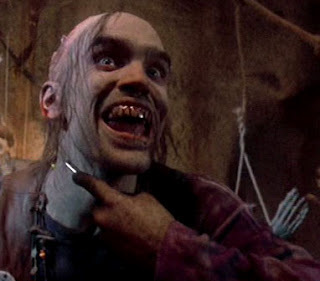 Anyhow, Bill Moseley’s Chop-Top owns the film. Gorging on enormous bites of scenery, Chop-Top is this close to stealing the spotlight from ol’ not-so-vegan-friendly-face himself. Hopper, on the other hand, is really of little importance. Despite receiving top-billing, his character sort of doesn’t do much of anything save spouting some biblical gobbledygook and engaging Leatherface in a climactic chainsaw battle. Or at least mimes one, as the titular weapons are never turned on during the action scenes. You can hear them whirring on the soundtrack even though you can see plain-as-day that the blades are not moving. LISTEN TO OUR DISCUSSION OF THE TEXAS CHAINSAW MASSACRE ON THE REALLY AWFUL MOVIES PODCAST! This entry was posted in Horror and tagged 80s horror movies, horror podcast, Sequels, Tom Savini by Really Awful Movies. Bookmark the permalink.